The core elements of a film startle effect are (1) a character presence, (2) an implied offscreen threat, and (3) a disturbing intrusion into the characters immediate space.7 Done well, a threat scene can activate the fear and surprise necessary for a film-based startle response. This is the essential formula (character, implied threat, intrusion) one finds repeated hundreds and thousands of times since Lewtons first bus effect. Lacking either character, threat, or intrusion, the possibility of startle appears negligible. Again, it is informative to reflect on films that seem likely to generate startles but dont. In one category we have loud, violent, and frightening scenes like those in a Quentin Tarantino or Martin Scorsese film. These very violent scenes can lead to suspense (anxiety), fear, disgust, and forms of anger at depictions of such content, but they do not typically lead to startles, likely because offscreen space is not sufficiently evoked. Missing, too, is the threat scene's sense of an uncanny space or object. Here I evoke both Freud's psychoanalytic uncanny, which emphasizes the unconscious recognition of archaic, repressed fears as well as a cognitive uncanny, which refers to a sense of foreboding that arises when perception and cognition oscillate indeterminately between two or more viable inferences, as when we view a realistic mannequin or a skilled mime who perfectly mimics a statue. These models of the uncanny are not mutually exclusive. Indeed, Freud's famous essay begins with the earlier cognitive theory and ends by refusing to discount this and other forms of the uncanny. 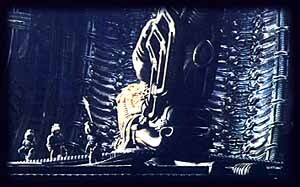 Sets and special effects evoke a strong sense of the uncanny in Alien. Then, too, there are film scenes where characters themselves are startled, but spectators are not. I call these "mock threat scenes," where the viewer watches a character teasingly feign a startle or attempt to startle a nearby character, as in Jurassic Park (1984), when Dr. Grant (Sam Neil) horrifies the young children he is shepherding through the park by pretending to be shocked by a massive electrified fence. In an earlier version from The Haunting (1963), Luke (Russ Tamblyn) annoys his fellow paranormal investigators during a spooky lull inside the old Hill House by leaping, yelping in pain, and claiming a statue stepped on his foot. Both films, of course, are notorious for startle effects that do work. Then there are parodic threat scenes/startle effects, as in Carl Reiners Fatal Instinct (1993), a parody of classic film noir and big budget Hollywood thrillers. Near the end of the film gumshoe Ned Ravine (Armand Assante), alone in his big dark house, opens a bathroom medicine cabinet--a black cat screeches and leaps out. Contextualized amidst constant silliness, Fatal Instincts cat-startle, itself formally indistinguishable from effects which have startled viewers, likely has yet to startle any viewer on this planet. Lastly, a romantic comedy like Something to Talk About (1995) fails to trigger spectator startles even though it repeatedly depicts the two lead characters startling one another. Although Julia Roberts and Dennis Quaid jump and scream loudly when they surprise one another in various domestic encounters, and the scene employs rapid editing, the lack of the full complement of threat scene elements precludes actual spectator startles. Additionally, not all sincere attempts at threat scene startle effects lead to startled spectators. Setting aside the immense variables of individual psychology and context, a few general response patterns seem to be at work. Along with the tone of a scene or sequence, pacing appears crucial to generating film startles. By "pacing" I refer to the speed at which a threat scene develops, a factor contingent upon rates of staging, camera and figure movement, editing. More complexly, pacing also consists of what we might label the viewers perceptual comprehension rate, the maximum rate at which he or she may recognize objects, their locations, trajectories, and velocities within real and simulated space. Human cognition always involves a predictive element--startle is often based on microsecond failings to anticipate the evolving identity, location, and/or status of a stimulus in a threatening context. We can tease out the significance of pacing to viewer surprise and startle by conducting a brief thought experiment. 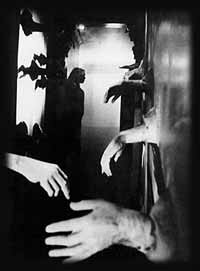 Let us take some infamously frightening threat scenes and potent startle effects, say from Night of the Living Dead, Repulsion (1965), and Suspiria (1977), and play them for first-time viewers on a variable speed projector. It is quickly apparent that the startle effects from all these films are rendered impotent when sufficiently slowed. The results are even more revealing: fear and disgust remain viable, if not amplified, during the slowed presentation. Evidently scene pacing and spectator comprehension rate impact viewer surprise/startle.